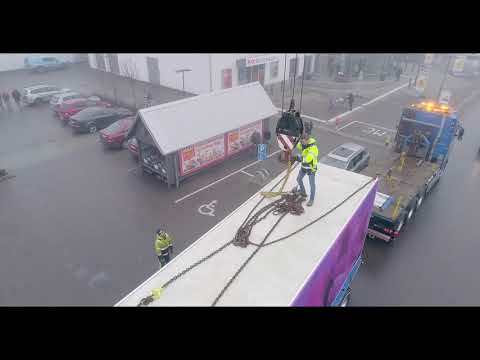 BOSTON, April 10, 2019 /PRNewswire/ -- Freight Farms is pleased to announce the launch of ICA Maxi Högskolan's own line of produce grown onsite for shoppers. Located in Halmstad Sweden, Freight Farms customer ICA Maxi Högskolan is one of ICA Gruppen's 1,300 grocery stores in the country. This month, the store began harvesting a range of hydroponically-grown greens for shoppers from Freight Farms' flagship container farm, the Leafy Green Machine. Freight Farms' Scandinavian distributor, FutuFarm, installs a Leafy Green Machine at ICA Maxi Högskolan in Halmstad. 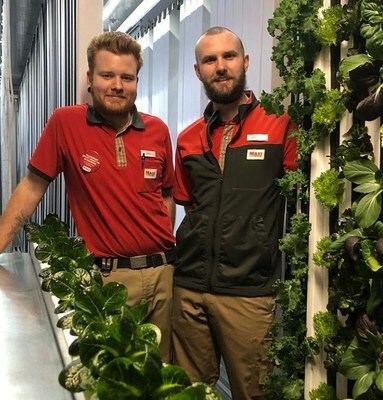 ICA Maxi Högskolan employees, Max Rydberg and Douglas Klang, now grow produce onsite for customers in Freight Farms' Leafy Green Machine. "We're excited to be the first ICA Maxi store to implement an onsite farm," said Rikard Hillarp, owner ICA Maxi Högskolan. "By growing crops just steps from our shelves, we're able to offer our customers what are truly the freshest greens possible." Freight Farms' containerized farming technology allows ICA Maxi Högskolan to create and maintain the optimal growing conditions to harvest produce year-round using less than 5 gallons of water per day. Beyond the store's initial offering of butterhead lettuce, spinach, and herbs, the farm's integrated IoT data platform, farmhand, will also allow the store to grow non-native crops otherwise unavailable in the region, regardless of seasonal limitations in Sweden's Nordic climate. "Freight Farms' technology is especially helpful in Sweden, where our short growing seasons can limit crop availability throughout the year and increase our reliance on imported produce," added Hillarp. "We're now able to shorten the distance food travels to get to our customers from 2,000 kilometers to just 30 meters." By removing the miles between the food source and consumers, produce maintains nutrient density and stays fresh for far longer, significantly reducing food waste for both retailers and consumers. On March 29, ICA Maxi Högskolan kicked off its launch with a Harvest Festival for customers, selling produce and offering free samples of the newly-harvested greens and a Q&A with store employees Max Rydberg and Douglas Klang, now the newest onsite farmers. "Our team innovated the technology to empower individuals and businesses all over the world to decentralize the food system in meaningful ways specific to their local community or environment," said Freight Farms CEO Brad McNamara. "We're thrilled to work with industry leaders like Rikard Hillarp and retailers like ICA Maxi, who together have the forward-thinking vision and reach to disrupt the grocery industry internationally." 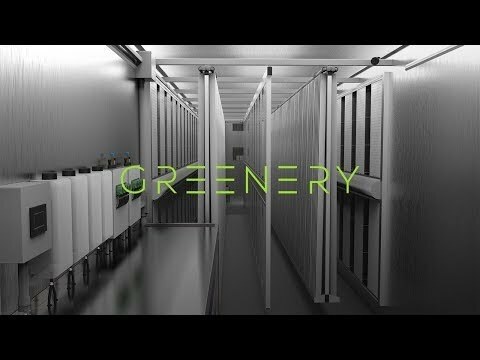 In 2012, Freight Farms debuted the first vertical hydroponic farm built inside an intermodal shipping container—the Leafy Green Machine—with the mission of democratizing and decentralizing the local production of fresh, healthy food. Now with the Greenery and integral IoT data platform, farmhand®, Freight Farms has the largest network of connected farms in the world, with global customers ranging from small business farmers to corporate, hospitality, retail, education, and nonprofit sectors. To learn more, please visit freightfarms.com, or visit us on Instagram, Twitter, or Facebook. For inquiries local to Scandinavia, please contact Freight Farms' official distributor, FutuFarm, for more information. With a focus on food and health, ICA Gruppen is one of the Nordic region's main players in grocery retail, with 2,079 wholly-owned or retailer-owned stores and pharmacies. Its ethos is defined by three entrepreneurial values: drive, innovation and the desire to take on responsibility. ICA Gruppen believes it has a great responsibility—and great opportunity—to have a genuine impact on the value chain by conducting its operations in a climate-conscious manner. To ICA Gruppen, a commitment to community engagement and improvement in sustainability mean long-term success. ICA Maxi stores, individually owned by grocery industry entrepreneurs, are the largest food stores within ICA Gruppen, with 84 locations across Sweden.